"If you wake me up during the summer, I'll make you suffer." Thanks to the success of television movies like Merlin and Gulliver's Travels in the latter half of the 1990s, Hallmark Entertainment established itself as a major player in fantasy epics designed for the small screen. In recent years, their efforts have met with decidedly mixed reviews and dwindling audiences (the overly ambitious and way too long The 10th Kingdom and the surprisingly uninspired Dinotopia among them). So a back-to-basics approach must have been in the cards as the company conceived its latest small screen entry. Although spotty, Snow Queen is the most accessible production to come from the greeting card folks in many a moon. Loosely based on the classic story by Hans Christian Andersen, Queen opens with a festive flourish in the 18th century as an outdoor winter gathering is in full swing. Merriment reigns until a tragic and mysterious weather-related accident takes the life of a young mother in attendance. Once jovial and full of life, widower Wolfgang grows beyond bitter while the couple's only child, Gerda, becomes increasingly withdrawn. As the story flashes forward to her teenage years, light at the end of the tunnel arrives in the form of a kindly lad named Kai whom Wolfgang hires as a bellboy for the family hotel. Initially cool to his sweet advances, Gerda is eventually won over by Kai's charm and sincerity. As romance blooms, she comes of her shell for the first time in years, finding joy in everything from snowball fights to her first attempts at ice skating. Initial euphoria proves short lived as during an evening stroll, Kai suddenly turns colder than the surrounding elements. Without warning, a sudden burst of wind blows snow and debris into his eyes. Thinking it nothing but a case of embarrassment, Gerda is shocked when Kai continues acting like an evil twin the next day. What she doesn't know is that he's been experiencing much the same circumstances that befell her mother prior to her death: Consistent visions of a woman dressed in white with penetrating eyes one can't look away from. Yet the vision turns out to be a living, breathing reality. In the midst of a blinding snowstorm that brings activity at the hotel to a halt, a mysterious stranger arrives dressed in white looking for shelter. And Kai. Hours later while expecting him to show for her birthday dinner, Gerda leaves the proceedings to investigate the delay only to find a crudely handwritten note in the hotel lobby consisting of just two words: "Help me." Vanishing as quickly as she materialized with Kai in tow and virtually no clues as to their whereabouts, Gerda decides to embark on a journey to find him. In the midst of her travels, she discovers that unless she can get to Kai and overpower the woman known only as the Snow Queen by the dawn of next winter's solstice, the only love she's ever known will die. 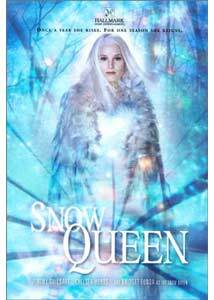 Equally involving and frustrating, Snow Queen is a very watchable piece of filmmaking due to the talent involved. Jeremy Guilbaut and Chelsea Hobbs are terrific as the doomed lovers (with the latter possessing a Liv Tyler-type sweetness), Robert Wisden hits all the right notes as the disgruntled father and Bridget Fonda is chillingly good and beautifully hypnotic in the title role. I'm sure the temptation to go over the top was there, but her quietly menacing approach is a better fit. Pluses aside, I wish I could give the same kind of enthusiastic kudos to the script and direction. Poor pacing and too many characters in the mid-section of the film threatened to derail the momentum of a strong opening. But Gregory D. Middleton's gorgeous cinematography and dazzling sets by Sam Higgins aid in diluting the weak points of the story. Image Transfer Review: With only a slight lack of sharpness being the only negative, a beautifully rendered transfer awash in color. Given the film's varied exterior/interior set-ups, a mastering job well done. Audio Transfer Review: Containing both a 2.0 and 5.1 mix, the latter is preferable due to the wider soundstage and more noticeable ambience from the rears. Extras Review: A much too brief 10-minute behind-the-scenes look at the making of the film is far and away the high point of the bonuses. A paltry photo gallery and a so-called trailer that turns out to be nothing more but a 1-minute plug for films appearing on the Hallmark Channel rounds things up. Although slightly overlong and over padded at times, winning performances keep Snow Queen from melting away.